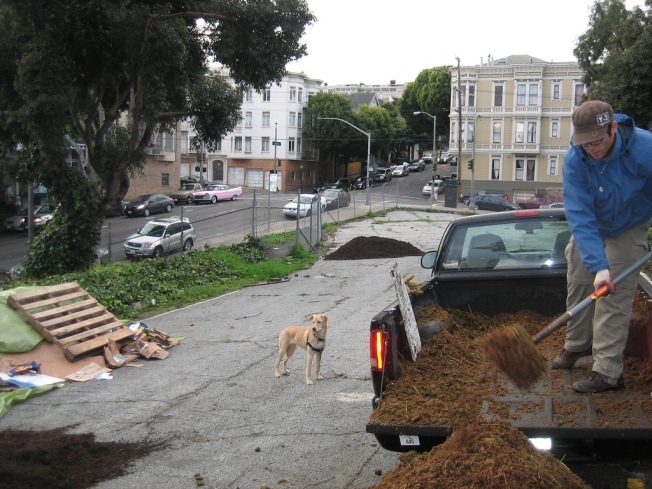 Horse manure and urban farming go hand in hand. A group of determined green thumbs have proven that things can grow out of the ashes of the City's dark days. The Hayes Valley Farm has blossomed fava beans and the urban farmers behind the amazing achievement are throwing a party to celebrate. Near the remains of the old Central Freeway on Laguna Street, between Oak and Fell Streets, residents were given a vacant lot to harvest as farmland until the City could pass the small strip off to a developer. The farm was cultivated by a $50,000 grant from the City to convert empty lots, not being developed during the economic downturn, into community benefit areas. Organizers of the street side farm will host a volunteer appreciation day this Sunday at 12:30 p.m. at 450 Laguna St. And if you haven't had a chance to become an urban farmer, they will have plenty of work for you to do.